Click here to purchase one of our tables! The best in the industry, white, two sided easy to clean melamine table top. This makes your table a true, multi-use table, not just a permanent, hard to clean single use Lego table! Our base plates are 2-Sided! They feature Lego on one side, Duplo on the other. They are total precision, perfection for the perfect “snap” fit. Another great benefit for our design, having the base plates be removable is this: your child may start a project on the base plates, then later remove the base plates with projects in tact. Now do another activity on the table like puzzles, Play-Doh, arts and crafts, homework. Then later, place the base plates back on the table and continue to build the projects! An additional benefit of our design is you may purchase an 24″ leg set to make this table taller…to grow along with your child! Our design is timeless. It is simple. It is made like a quality piece of furniture. Bag in the center: Table top is an permanent Lego top…cannot clean easily. Kids climb up onto the table and jump into the bag tearing it. Bag in the center limits that are for building legos. No melamine multi-use top for puzzles, Play-Doh, etc. Too low to the ground, does not allow seating. Lego Dacta: Too expensive. Permanent Lego top, hard to clean. No melamine table top for multi-use. Kidkraft: Too low to the ground, does not allow seating. Table top is lego…hard to clean. Particle board construction. There are lots of other tables out there but if you study them and note these things we’ve pointed out here you probably will conclude that our Nilo table is the best thing going. 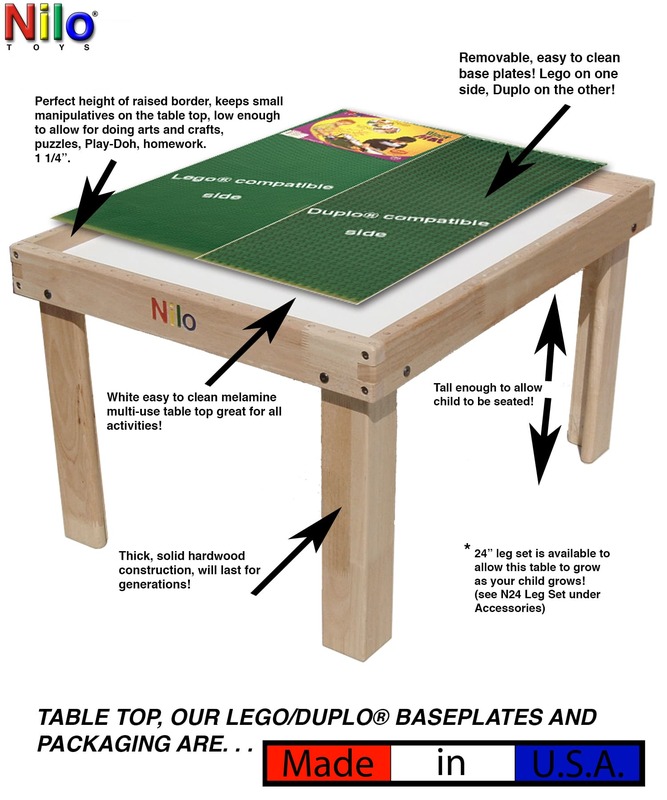 Note, ALL OF OUR TABLES ARE LEGO/DUPLO tables since you can purchase the base plates separately to make them so. Its just that our N34 table we’ve always marketed with the base plates. We also offer the N34X which is without the base plates. You have to agree though, to be able to remove the base plates to clean them or to be able to do some other activity on the white melamine table top….what can possibly be better than that? Oh, and note that our base plates are MADE IN THE U.S.A., as well as the table top and packaging! Finally, you may purchase our N24-24″ leg set to make this table taller! Boom! http://pomomusings.com/2014/11/13/best-play-table-for-kids-the-nilo-table/ Here’s another link to an pastor that did a little write up on our table. Copy/Paste into your browser. https://play-trains.com/best-wooden-train-tables/ This blog site features many different Train Tables being offered today…but you will find that ours is the best. Please compare Nilo® to all others out there! Please read the REVIEWS our customers have posted as well…quite impressive! Just go to the product you want to purchase from us and then scrwll down to Reveiws and read away! Thanks for your consideration! There isn’t a better made, more versatile Lego Table, Train Table, Play Table on the market! Normally, you get what you pay for. As enticing as it is to purchase an cheaper, lesser quality table out there, many times you end up having to purchase another table just six months, a year, two years later. In the case of our Nilo tables…you never have to purchase another table…it will last for generations! You will use it with your grandkids! THANK YOU FOR YOUR CONSIDERATION! You will be most pleased with your purchase should you decide to buy! Purchase one today, GO HERE: https://nilotoys.com/product-category/tables/ Then, select the table of your choice! Decide which size of Lego Table, multi-use table you want to purchase, either N34 (24″ x 32″) or N51 (32″ x 48″), both are 19″ to the top of the melamine multi-use surface. Next, decide if you want holes around the framing, or our “No Hole” table. See our Accessories…Slide Hammer ‘N Nails, Nilo-Jax, Rok-Jax, Fiddlestix, Nilo-Nails for why you may want an “With Hole” table. Basically the holes allow for fun activities! Now, decide if you want our table “with” the Lego Base Plates (Block Mats as well call them), or if you want just the table with the white multi-use melamine top alone, or if you want our large N51 table “with” the Graphic Play Mat (currently unavailable). Any selection you make will be AWESOME since your buying the best there is in an true, multi-use Kids Activity Table, Lego Table, Train Table for your family! Cheers to that!